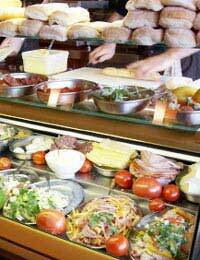 Faced with the many delights of the deli counter it is easy to get carried away. Whether you are choosing a few items to tempt guests with pre-dinner appetisers, or making substantial choices for a buffet meal, you will want to keep high calorie foods to a minimum. As a broad guide, you may want to give a wide berth to any pastry items, which are certain to be high in calories. The exception can be filo pastry, which is roughly two-thirds the calories of shortcrust pastry, but it is still 97 calories and 3.7 grams of fat for every 25 grams weight, so keep this in mind when considering portion sizes. Fish of different varieties make interesting deli dishes and they are generally much lower in calories than meat. White crab meat is virtually fat-free and is only 22 calories per 28 grams. Peeled prawns are 30 calories per 28 grams and are delicious served with a low calorie mayonnaise and lemon dip. Smoked salmon is more affordable now and is worth considering. A 60 gram serving has 80 calories and a fat content of 4.5 grams. Serve on blinis (tiny pancakes) or crusty bread with wedges of lemon. Salamis and liver sausages are full of flavour but are high in calories and fat, some 83 calories and 7.7 grams of fat for two small slices. Parma ham, often teamed with melon or avocado, has 60 calories for 28 grams and 2.4 grams of fat. Colourful salads are an attractive addition to the table and they can be put together quickly with some well chosen deli items. Ratatouille and mixed beans both make excellent salads when combined with cooked pasta shapes. Drain off any oily dressings to keep the calories down. Sundried tomatoes are intense in flavour and are excellent in dips and salads. They are high in calories if packed in oil, so should be drained and rinsed to use sparingly in appetisers. A better choice is to use dehydrated sun dried tomatoes. It is difficult to keep calories down when you are buying prepared desserts. The best ploy may be to buy whole cheesecakes or flans and cut them into very modest portions. There are often exotic fresh fruit salads available and these would make a healthy choice. You can either serve them plain, with crème fraiche or fromage frais provided separately; or you can buy small, low calorie, ready-made meringues, and fill them with low fat cream or creme fraiche and top with fresh fruit. Depending on the time of year, fruit salads made entirely with ripe red and dark blue berries make attractive and delicious desserts with a mere sprinkling of icing sugar. A board of special cheeses is always popular and you can choose a good variety from half fat and light versions. All the cottage cheeses are low in calories and soft cheeses like French roule make good choices. The blue cheeses are fairly high in calories but a little goes a long way because of their intense flavour. Serve the cheeses with a selection of low calorie crisp breads, or French toasts or poppy and sesame thins and ripe pears and grapes. Olives are popular nibbles to serve with drinks but they are high in fat and salt. As a rule of thumb, black olives contain less fat and salt than green olives. Also make sure you select olives packed in brine and not oil. Pickles are generally very low in calories so you an afford to dot bowls of these around the table. Gherkins are only 3 calories for 28 grams (with no fat content) and silverskin cocktail onions only 5 calories. Nuts are popular but are mainly a high calorie, high fat choice. Cashews have 176 calories and 14.2 grams of fat for 28 grams. Macadamia nuts are a sizeable 209 calories and 21.7 grams of fat per 28 grams of weight. Plain breadsticks, at around 20 calories each and only 0.1 grams of fat are good fillers to serve. Don’t forget crudités or strips of raw vegetables are popular and very low calorie. The following is a very easy, low calorie recipe for a dip to accompany them. In a small bowl, place the sun-dried tomatoes and just cover with boiling water. Leave to soak for 15-20 minutes. Drain the tomatoes and cut into small pieces. Put the cream cheese into a bowl with the chopped tomatoes, pesto and shredded basil leaves and mix together. Serve as a dip for vegetable sticks or to top wholegrain crackers.